The Letter to the Hebrew is more homily than letter. It is written to an unknown audience by an unknown author. It explores what is at the heart of Christianity; Christ death for us. Jesus offers Himself, freely passing from death to glory, his human nature perfected, bringing we, the children of God to glory with Him. In chapter ten nearing the end of the homily, the preacher has addressed teachings about God and how we live a moral life through God’s grace. Continuing we are challenged to approach God in confidence; in faith, trust and hope. Followers of Jesus have been persecuted and may wonder if their suffering is worth enduring. But the preacher insists, do not lose your confidence for you will be rewarded. There may be bleak times, it may appear God is not assisting or giving grace, do not lose your confidence. You may be struggling in a relationship, a family member may have died, you are financially insecure, you are doing all you can to endure suffering, do not lose your confidence. In confidence endure, proceed in faith, trust and hope, knowing God always keeps His promises. 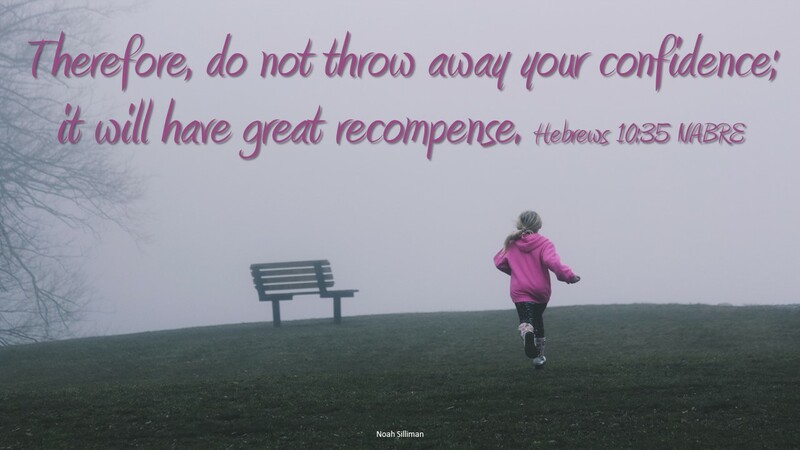 You came to Jesus for a reason, endure and do not lose your confidence. You are not someone who pulls back and loses faith, you are someone who maintains confidence, endurance and will possess life. Life throws challenges at us. Every day is filled with distractions and unfulfilling tasks we do to survive. But our trust is in the Lord. God is for us, we will endure, we will possess life, and we will have a great reward. Live that others see your love and gain the confidence you possess. Are there times when you look toward God wondering if he really cares about you? In those moments when God is fully present do you capture the feeling to rebuild confidence? Next Next post: The Roman Catholic Church is in a season for real change.